A Guide To Raising Kids Who Love To Practice Hospitality is full of practical tips, fun ideas, stories, and printables to help you teach your kids to have a generous and hospitable heart towards others. Get your copy through the link below. When most people think about hospitality, we usually think of it as something adults do. We invite people in to share a meal, fellowship and talk about our lives together. Many times adults focus just on each other, and the only role the kids have is to go play after the meal so the adults can visit and not be bothered. But what they forgot was, hospitality is for all ages, not just something you do when you grow up. In fact, opening our home in hospitality should be a family event where everyone participates. It is also important that we teach our kids hospitality is not about showing off their house, toys, or meals that are served. Hospitality is about God and how he uses us and our possessions to serve those we come into contact with, both friends and strangers. 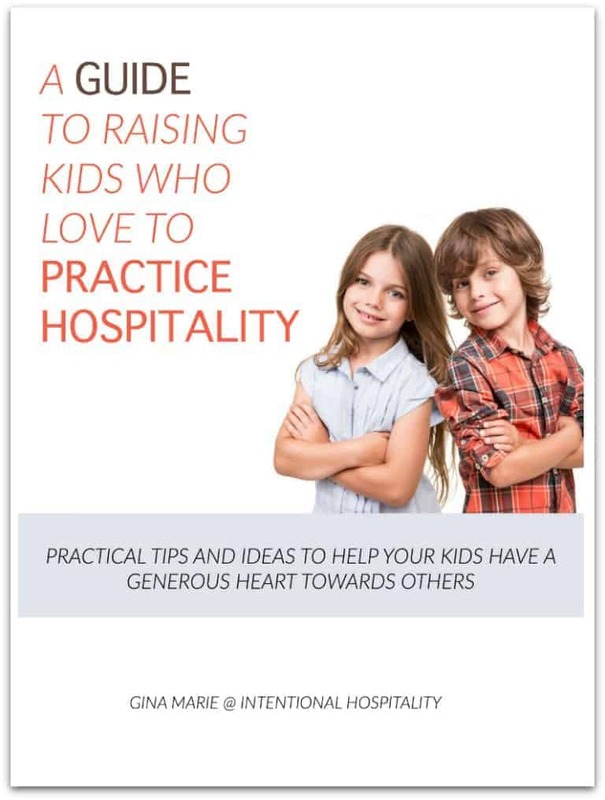 I have written A Guide To Raising Kids Who Love To Practice Hospitality filling it full of practical tips and ideas to help you teach your kids to have a generous heart towards others. I start the ebook with QUESTIONS FOR TEACHING MOMENTS. There are questions for preschoolers, elementary age kids and teenagers that will open communication between you and your kids as to what hospitality really is. These questions will help you encourage your kids to think about how they should treat others when they come to your home for a visit. Next, we jump right in with GETTING STARTED. This section is full of practical age-appropriate ideas to get your kids involved in showing hospitality to their friends, family, neighbors, or new people in your community. LESSONS ON HOSPITALITY FROM THE BIBLE section is designed for you and your child to read through together. There are three stories from the Word that will help your child think through being hospitable. After each story, there are questions and answers to each story which will guide your child into understanding the real meaning of biblical hospitality. WHAT IF HOSPITALITY IS A NEW CONCEPT TO YOUR FAMILY? In this section, I help you take the first steps to becoming a family of intentional hospitality. 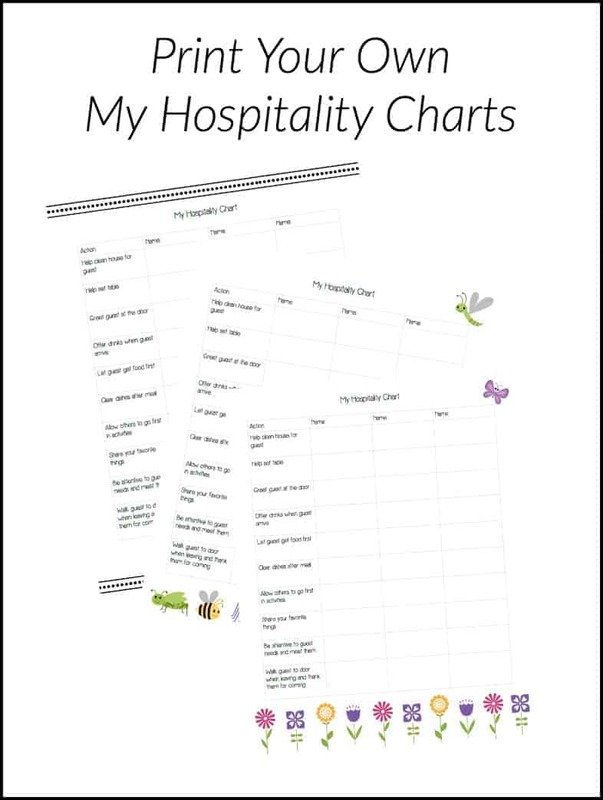 To help you teach and encourage your kids to practice good hospitality when company comes to your home, I have created MY HOSPITALITY CHARTS. Let your child pick out their favorite chart and then print a copy for them. Have your children review their chart before your company arrives, reminding them that each one of these gestures shows your guest that they are special when visiting your home. When all your guests have gone home, award your child a star or check mark for each gesture that they remembered to do that evening. 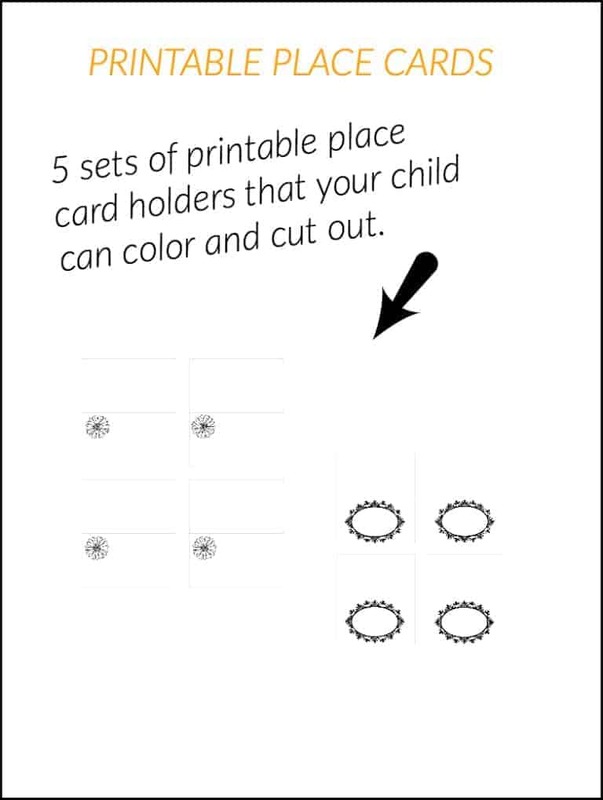 Included also are PRINTABLE PLACE CARDS that your child can color and cut out. These are a great way for your child to feel included in preparations for guest coming for a visit. To get your copy just click the link below for a quick and easy checkout. I hope you find this guide helpful. Be sure and leave a comment on your kids progress.